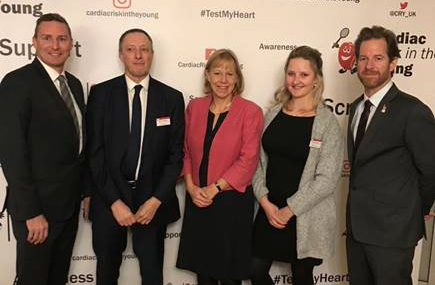 On Wednesday 21st November, Ruth Cadbury MP attended Cardiac Risk in the Young (CRY) launch of a new, nationwide survey about the governments approach to sudden cardiac death among young people. At the reception all MPs, including Ruth, were advised of CRY's ongoing campaign #MPsupport4cry. To date, 118 MPs, including Ruth have pledged their support to establish a national strategy for the Prevention of Young Sudden Cardiac Death in the UK. Cry's new survey showed that 82% of UK adults think the Government should be doing more to help prevent sudden cardiac death in young people, with 82% agreeing that all young people (aged 14 - 35) should be offered cardiac testing via a free, national screening programme. Every week in the UK, at least 12 young (aged 35 and under) people die suddenly from a previously undiagnosed heart condition. In the vast majority of cases, the first sign of a problem will be the last sign and therefore the only way to detect a potentially fatal cardiac abnormality is through proactive cardiac screening by specially trained cardiologists. Ruth Cadbury MP, pictured with local constituents and CRY supporters Paul and Ellen Clabburn, said after the event that; "I was delighted to attend CRY's parliamentary reception and would like to congratulate the charity for the ongoing success of its #MPsupport4CRY. I know how important the issue is, as just this month, Brenford FC's technical director, Robert Rowan, who was only 28 passed away after a cardiac arrest. It's vital that the Government act, and introduce a national strategy to prevent sudden cardiac deaths among young people. Dr Steven Cox, Chief Executive of CRY, commented that; "These new stats, reflecting public opinion, reinforce our campaign to make the Government sit up and acknowledge the massive impact young sudden cardiac deaths have on our society. It remains of huge concern to us that current UK policies are still contradictory, with guidelines based on incorrect assessments of the incidence, methods of diagnosis and positive management of cardiac conditions in young people. "That's why cross-party support for a new national strategy is so crucial, ensuring that the guidelines and policies to prevent young sudden cardiac death are consistent. And, the first stage of such a strategy must be to correctly acknowledge the incidence of these deaths." 1A survey was conducted among 2,001 UK adults aged 18+. The research fieldwork took place between 18th-22nd October 2018. Atomik Research is an independent creative market research agency that employs MRS-certified researchers and abides to MRS code.